You can join this course at any time throughout the year. It is a course designed to draw on Brighid’s folklore, folkmagic and ancient wisdom through art and ritual. Want to Develop or Deepen a Relationship with the Goddess Brighid? Would you like to work with Brighid and be able to draw on her unique wisdom but feel stuck in building your personal practice? Do you feel a longing to reclaim your ancestral roots? Work with Brighid and drawn on a vast source of her unique wisdom and traditions. Day 6 - Brighid’s Hearth Celebrate the Energy of Brighid’s hearth & celebrate with art! Day 7 - Smooring the Fire Create your own nightly ritual to protection to your house and extend that protection out into the world. Day 8 - Folk Magic - Brighid’s Charm Find out the magic within the words of Brighid’s charm and create your own to meet your own personal needs. Day 10 - Brighid as Midwife Explore Brighid’s role in midwifing the soul back to the otherworld & how she brought keening to the world. Day 11 - The Caim Learn Brighid’s unique prayer which you can enact at times where you are feeling unsafe and need her protection. Day 12 - Brighid’s Augury A unique mode of prophecy Brighid is said to have created - practice this technique for yourself! 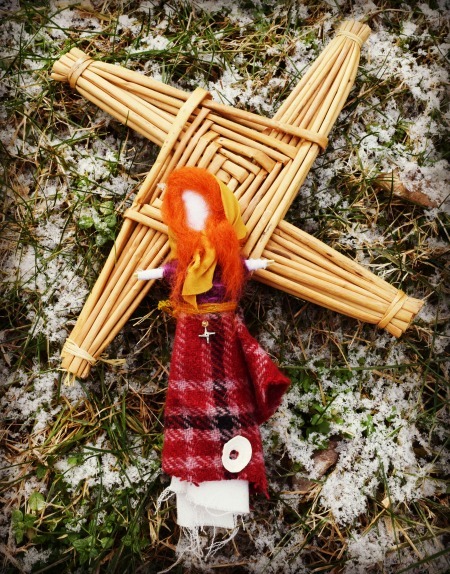 Day 13 - Clooties With many wells and springs dedicated to Brighid, learn about this tradition plus creative ideas on how to adapt it for your own use. Hi I'm Jude Lally - artist & writer. I received my MSc in Human Ecology (with the University of Strathcylde, Glasgow, Scotland) with a study of the Goddess Brighid and her importance to Scottish Female Cultural Activists. I'm a Cultural Activist in the Bean Feasa (Wise Woman) tradition and my role is introducing women to the Ancestral Mothers and their wisdom through art, ritual and imagination through teachings in online courses, in-person workshops and our annual Scottish retreat.